I’ve shown you lots of pretty pictures lately and haven’t angsted at you for a while. Time to remedy that. While I was out of town, Hubby took Rodney for a spin on the lunge line. He – the horse, not the hubby – farted and fussed as you would expect from a horse used to a life of leisure. However, Hubby thought Rodney’s back was much softer. He didn’t have faith in all the woo-woo things I had been doing, but now he had to admit they were having an effect. There were even brief glimpses when Rodney was relaxed and possibly willing to listen. Time to go back to work. My reluctance could be a protection from further disappointment. A natural enough response but it feels more than that. If Rodney became a reformed character overnight all I can see are an endless slog of tack fittings, 20-meter circles, and crossrails w/o stirrups. All so I can get up at o-dark-silly to tangle his mane into knots, cart him off to a dustbowl of a showgrounds, and show until I’m so hot my brain melts. It feels as if I am contemplating a dive into a vast sea of pointlessness. When I have time after our busy show season, I will reread this and & wonder what all the stewing was about. However, one of the aims of a daily blog is to record what one is feeling moment to moment. What I’m feeling at the moment is weary. 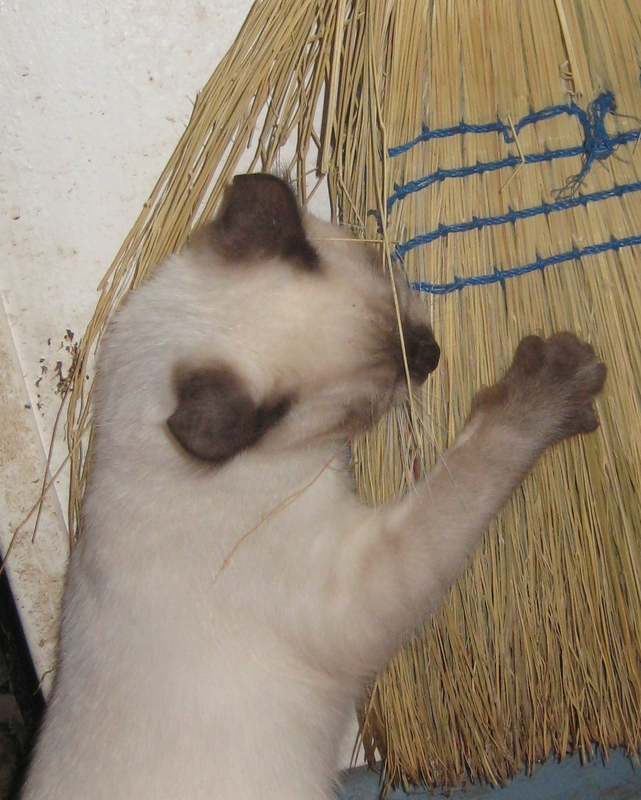 Broom or cat toy? You decide. Be careful what you pray for…..
That’s great news about Rodney, I think. Provided it’s not wishful thinking on his part. He really, really, really wants this to work out, from self-protection if nothing else. What Joan said …. I applaud your honesty, your willingness to say (write) what you’re really thinking. I go back and forth almost daily about boarding my horse so I can ride more often and actually get back to “schooling” her … as opposed to just … um, enjoying riding her. Now that I’ve said it, it sounds kinda nutty. But truth of the matter is, between the miserable weather (no indoor in my back yard) and the fast-approaching hunting season (she’s a chestnut) I’m thinking boarding for a few months might actually be a good thing to do. Of course that won’t cure my boredom with riding in circles, but a lot of people do it and seem to like it. Perhaps it’s contagious and if I expose myself to it, I’ll catch the bug? Doubtful, but not altogether impossible. re boarding: I say go for it. If you have the $ and a place to go for a month or two, give it a try. You may find she enjoys exercises. If you decide to bring her home and “just” ride her, you’ll know that’s what you both want to do. re hunting: Yes, my brown quadrupeds are always done up in blaze orange tape. I console myself that folks around here have been hunting all their lives. When I was in VT, we would get folks who came out to the woods once a year. They made me nervous.